Learn More. Care More. Be More. Aloha Parents and Guardians. As you may have heard, Pearl City High and Highlands Intermediate were made aware this morning of threats to their campus on social media. Law enforcement was contacted immediately and is working closely with the Complex and impacted schools. 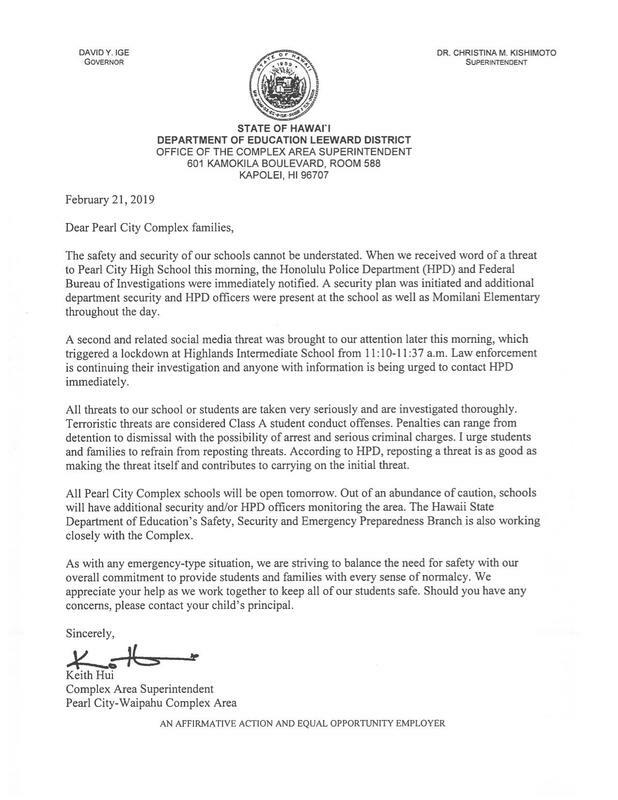 We ask that you please click on the letter to view the parent letter from Complex Area Superintendent Keith Hui regarding this situation. Mahalo. Visit http://bit.ly/FERPAHI; see Annual Notification of Privacy Rights memo to get more information. E-cigarettes are to be included in your school’s current contraband list. This is to inform students and their families that e-cigarettes are considered contraband and that a student violation of this offense is subject to the disciplinary actions of HAR Chapter 19. Schools are required to manage and inform the public of the importance of keeping our storm drains clean of debris and pollution. afternoon drop-off times for all school grade levels. option to modify their school search selection via a drop-down menu. Results are displayed in a list and map form.